It’s all just too much, isn’t it? The neon glow of network and connectivity that are the monitors of our everyday; the invasion of information that not only leads to knowledge but to a sinking, menacing inner turmoil: anxiety. The abundance of entertainment media in our everyday lives has given rise to transformation and reflexivity within society; we are always connected, always consuming, and always representing. The screens that we have access to allow us to transcend the physical to enter our cyber lives. Beyond this transcendence, we fold the cyber into our physical worlds, blurring boundaries. In accessing media we merge with the machine; we become quasi-divine. The cyborg finger taps away at Tinder in search of his next date. The finger is disembodied, it does not know what it is tapping at, but its design ensures the greatest success within this dating-app interface. This is Lonely Sculpture, exhibited in Tully Arnot’s solo exhibition Uncanny Residues at Wellington Street Projects. Uncanny Residues is a repository of Arnot’s latest sculptural experiments. Manipulating and reinterpreting existing understandings of everyday objects, their function and our relationship to them are the central themes of the work. Throughout the exhibition the human is removed and the object is given independence. In some cases this is to perform a human function, while at other times it is by emulating human behaviour. Lonely Sculpture blurs a human behaviour that screens and digital technology have already blurred. This is a piece of technology that reflects the way we already interact. Dating apps like Tinder are an aspect of socialisation that allows for isolation: it reduces identity and demands judgement. The work heightens an absence or disconnect that already exists with this form of interaction. However, Lonely Sculpture does not reserve judgement. The artist’s mechanised silicone index finger taps yes to every dating profile that appears on the screen, even when the screen is loading new profiles the finger keeps unconsciously tapping, anticipating, longing. If Lonely Sculpture is concerned with highlighting the disconnection and isolation that can be found in entertainment media, then the Arnot’s other major piece Nervous Plant can be seen as a digital experience made physical. Nervous Plant embodies and animates the changing nature of social interaction in physical space. Nervous Plant at first sight is simply like any other plastic pot plant, except it is a little too giggly. As though lifted by a continual light breeze, the plant dances on the spot. That is, until you stand next to the plant. Then it freezes. The plant is shy, you see—nervous. Hooked up to a light sensor, the movement of the plant is directly related to the amount of light it generates to its branches. When a person stands next to the plant, the shadow created blocks the light, pausing its movement. Human behaviour is applied to the synthetic, generating a social disconnect. This is a work that is mechanic and artificial, and a simulation of human behaviour. Technology enhances and isolates Nervous Plant. Not only does technology mediate our experience, but we mediate its experience also. Where are the lines separating reality and un-reality? The fragmentations of reality, and its representation, are central ideas to the writing on the Neo-Baroque by Melbourne-based academic Angela Ndalianis. The desire to make concrete the spiritual and non-representational in seventeenth century Baroque art and architecture is inverted in the art and entertainment in our contemporary culture. In her writing Ndalianis points out that what we have seen in the late-twentieth and early twenty-first centuries alongside the growth and access to material technology is the desire to rupture the concrete by imbuing it with spiritual qualities. In embracing technophilia, the human body and the parameters of self are blurred. This is not only the case with individuals defining themselves, but also in the interaction with others. Computers, televisions, and mobile phones: these are our screens. We live our lives between and through these monitors. We are never without a screen. Our embodiment is negotiated through them. We connect, and we disconnect, but we are never disconnected. In traversing multiple realities simultaneously one also traverses multiple identities. However, is a constructed, or re-constructed, identity an authentic one? In 2013, Audrey Hepburn, Marilyn Monroe, Grace Kelly and Marlene Dietrich each mounted their comeback. Pried from the dead to deliver new performances (Hepburn in a commercial for English chocolate company Galaxy and Monroe, Kelly and Dietrich for J’Adore by Dior), what we are exposed to are the life-rejuvenating technologies born out of an advertising agency and a post-production studio. This is CGI with aplomb. For an audience, the viewing of these visuals is an experience of an uncertain or ambivalent reality, but this has become our everyday experience: dream-like, digitally-bound, and delivering instantaneous pleasure. This is a piece of marketing, entertainment and spectacle born out of techno-scientific innovations. However, it is also an example of romantic nostalgia, of trying to imbue the past in our everyday, of reimagining identities. More than anything it is perhaps an animation of the anxiety of our present. Presence has a multiplicity. Anna McCarthy is a writer who analyses the role television has on perception and desire. In ‘From Screens to Site: Television’s Material Culture, and its Place’ (2006), McCarthy speaks about television as a technology of ‘space-binding’. What this means is, because television presents images and representations of the world – regardless of how far or near that world is to an individual’s everyday – conceptions of distance are flattened. The writer further outlines that ‘[television is a form of] remote inscription that produces – and annihilates – place: the place of the body, the place of the screen, the place of dwelling.’ At the core of McCarthy’s discussion is that the window into an imagined elsewhere challenges perceptions of the distance of the images presented to those engaging with this media. But television is just one screen. Both of the above texts focus purely on television’s role, however, we are living in a time where our access to screens has diversified and become increasingly mobile. Beyond this, we have controlled identities when navigating different platforms on mobile screens. Not only are we being presented with an imagined elsewhere but we are also an active producer, and participant in its representation. Screens are an appendage; they are the access to our mediated experiences of the world. The identities created and mediated through screens seem authentic because they exist in our everyday. Transcendence into this quasi-divine breaches the borders of the self, but what effect does that have on the individual? JD Reforma has Kim Kardashian’s bikini-clad body stacked with cakes of skin-whitening papaya soap. Presented as a montage of torsos on a single sheet of paper that forms an infinity symbol, the work Sunset/Body for Days provokes an interesting dialogue around body politics, desire and ethnicity. As a subject, Kim is flawless. In her representation through media, the separation of Kim’s body and persona has been flattened due to the multiplicity of the screens that she is presented across. If you are connected, her body is unchanging and omnipresent. It is with you every day and asking you to always consider your own. Maybe you need to pick up that bar of soap. The space we occupy amongst the images that are presented to us daily is a recurring theme within Reforma’s Kudos Gallery exhibition Life & Style. The artist avoids generating new images, instead choosing to augment found images. The artist sources stills from music videos and gossip magazines, as well as objects that would feel at home on a David Jones shop floor. Hardly images one would kill for, but ones encountered casually and that are desired for everyday pleasures. The artist indulges the recognisable but shifts its context to make overt the spiritual qualities that we imbue in the things and images that occupy our everyday. Infinity Pool is a series of works in Life & Style that depicts, like an IKEA set, a window into the poolside decadence you are yet to achieve. Desire and aspire: the cool breeze, the fresh water, the lounging with gossip mags — desire and aspire. All of these images are recycled. Be it the bottles of Evian, the vinyl print of the ocean or the Dyson fan, this is the mise en scène of the paradise we have yet to transcend into, but the reminders always linger. They are the objects and images of the lifestyle that we are asked to yearn for. The life and style you do yearn for. Life & Style is an expression of the longing embodied by objects and images. Water is paradise and affluence. It’s tangible but elusive. Always longing for it. The artist acknowledges the transcendence that objects and images have come to represent, but his work is not a part of the digital enclaves and god-like bombast of the aforementioned advertising agency and post-production studio. Instead, Reforma, and the work in Life & Style, is a product of it. Never relinquish control. Conscious or not, it’s an attitude hard to deny when experiencing the ambiguous reality of Acid/Gothic, from curator/artist/writer/producer Nick Garner, and exhibited at Galerie pompom. The premise of Acid/Gothic is to be a conduit for the overlapping ideas of psychedelic art and the gothic, with the intersection becoming the lens through which the curator aims to view the world. Hung at Sydney’s Elizabeth Bay House for a single day (public not invited) and then filmed from the perspective of a ‘character’, Garner then projected the first-person-perspective film across two screens at Galerie pompom (audience invited). The exhibition features work from emerging artists, established contemporary artists, work on loan, and film excerpts presented on a loop. 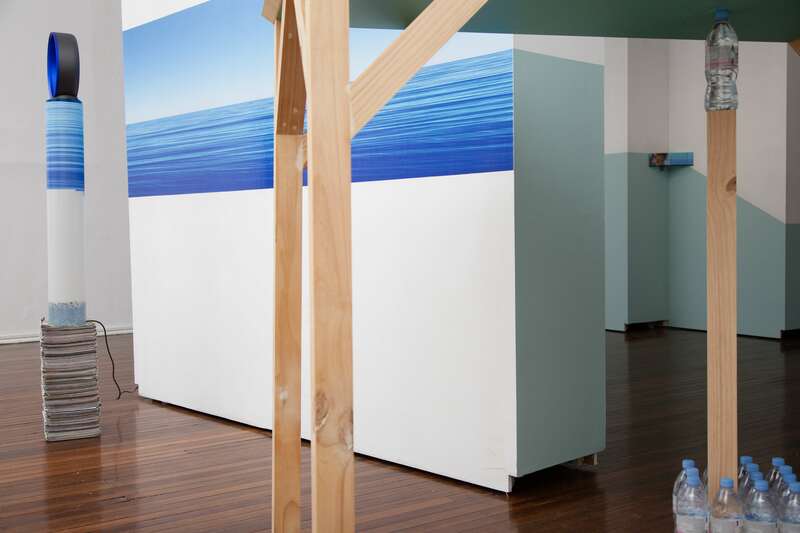 In the exhibition all the audience can see are two screens that present the group exhibition Garner hung at Elizabeth Bay House, with each video seemingly from a different perspective. The perspective, from which we view in each of the two screens, is not that of two different viewers but one split view. Garner presents one 20-minute loop out of sync across the two screens. The journey of the two perspectives runs concurrently. When the journeys cross paths we see the viewer, and we watch as they watch. How they watch. What they watch. The Galerie pompom exhibition actively confuses the status of subject and object. The exhibition relishes in ambiguity and uncertainty to drown the audience in a dream-like trance. The exhibition is mediated. The audience is static. The viewer views the viewing. Acid/Gothic is not only a mediation on the process of viewing, but also on how things go together, how we assemble. With Acid/Gothic we see exactly how Garner wants us to see. He constructs a reality to show exactly how constructed the world is, and conversely, just how separated we can be. Garner recognises the same object/image identity anxiety of Arnot and Reforma, yet pushes it to the distance—into a dream, into a screen. The screens that give access to entertainment media and that mediate our social experience extend our personalities into multiple realities. Defining and portraying self is a process funnelled through different digital technologies. The self is ricocheted across our cyber platforms and reflected back to us. We have reached a quasi-divine state because so much of our identity exists solely inside the screens of an imagined elsewhere. Representing self is a process of representing a convergence with multiple worlds. The concrete is transcending. Meaning is conflated, identity shifts. Tully Arnot, Nervous Plant (2014), Arduino coding by Dr Josh Harle. Courtesy the artist. Tully Arnot, Lonely Sculpture (2014), Arduino coding by Dr Josh Harle. Courtesy the artist. 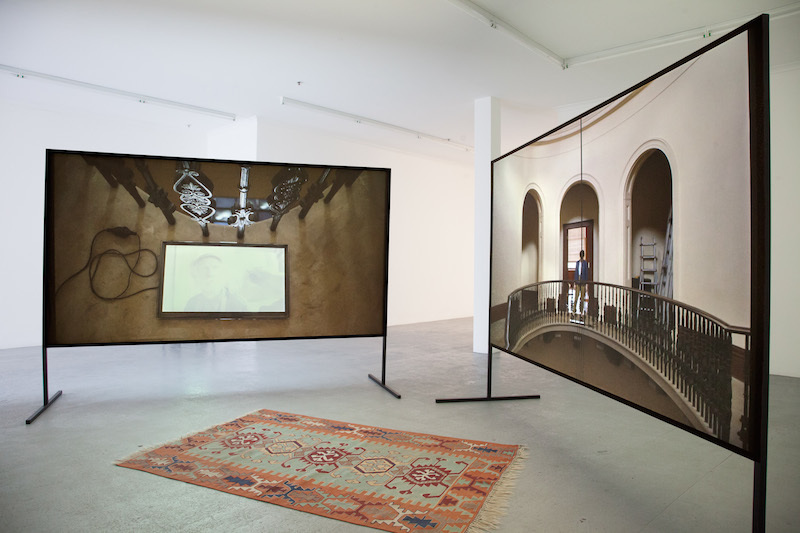 Acid/Gothic, 2014, 2-channel video with sound, 17:58 minutes (looped), double-sided screen, aluminium stands and frames, rug. Dimensions variable. Curator: Nick Garner; Choreographer: Jess Olivieri; Exhibition Filming: David Barker Artists: Gary Carsley, Pia van Gelder, Tracey Moffatt, Sarah Mosca, Tomislav Nikolic, Jess Olivieri, Giselle Stanborough, Peter Weibel Installation view at Galerie pompom. Photo by Brett East. JD Reforma, Infinity Pool [New Horizon (2013), Earth, Water, Air (2013), Spring (2013)] (Installation at Kudos Gallery), 2014. Photo by Brett East. Courtesy the artist. JD Reforma, Sunset/Body for Days (installation at Kudos Gallery), 2012/2013. Photo by Brett East. Courtesy the artist. Angela Ndalianis, Neo-Baroque aesthetics and contemporary entertainment (Cambridge: MIT Press, 2004).